So, I got the shipping note that my 2016 Simple was on the way, and I checked the USPS website daily until they said my parcel had arrived and then it was the turn of Parcelforce until I got the note on my doorstep that it was in the local depot. I phoned the depot to see how quick it could be delivered and they said you can collect it…. I was in the car before the lady at the depot had put the phone down! So I got my parcel <insert squealing and excitement here>… I knew there was some assembly required, but some serious thought had gone into this. The bed assembly consists of the X motor, X end stop, mounting plate and the bed, already with the belt fitted and tensioned. It required the connection of the motor wire and the end stop wire. Four screws and you’re good to go! The box contained a neat little spool of filament that sits nicely on the spool holder. The thread on the spool holder is such that the turning spool will not loosen it, another well thought of idea. The videos on the website give clear instructions on the first print and showing you round the menus on the touchscreen. This printer is really an order of magnitude better that the original Simple. Don’t get me wrong, I love my Simples (I have 3) and they are real workhorses, but there is always a bit of tinkering required to get the best quality out of them if you move them around. There are loads of community mods for the Simple (I’ll call it the v1 from now on), but the 2016 doesn’t really need any. I’d like to see a heated bed, but with the rails and stuff, that may not be the easiest add, but for PLA it doesn’t really need one. The Touch Screen LCD make this a truly standalone printer. No hunting through menus for this printer. Clear buttons and icons make navigation through the options so simple. The two wiring looms on the v1 has been replaced with a tidy ribbon cable. It makes the whole printer look more ‘grown up’ than it’s predecessor. The ribbon is routed along the inside of the Y arm and runs the connections for the extruder assembly and fan . The 2 individual Y/Z bearings, joined by motor mounting plate has been replaced by a seriously hefty piece of aluminium. This gives more stability and really looks the business. This is so much more than just a printer though. The new controller board, based on the Tiny G of CNC fame make the printer a lot quieter in it’s movement and the motors barely get more than warm. The cloud based slicer and repository, with direct ties into your Thingiverse account and your saved items. All the things you saved as a ‘I need to print this’ can now be dropped, over the air, onto the printer and just printed. No more, downloading, slicing and printing. 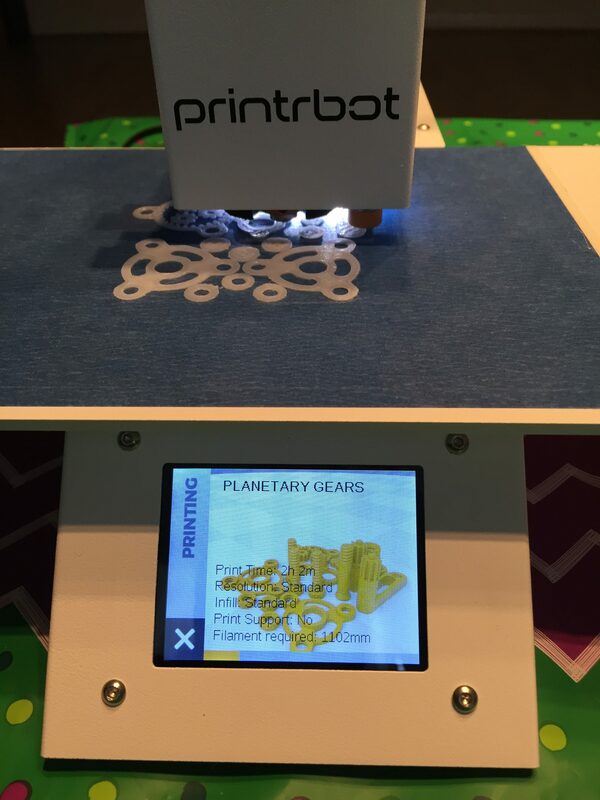 Import the project to your cloud account direct from Thingiverse and you’re off and running. Once the files are on the printer, you can print without a wifi connection, just swiping on the touchscreen and pressing the print button. I’ve had this printer a couple of days and I really felt the urge to write about it already. It is a major step forwards, not just for Printrbot, but I think there will be more people using this technology on other printers. I’d love to try and retrofit the G2 and LCD to a v1, to see if the performance is just with the controller or the printer as a whole. (If you have one spare guys-you know where I am :-)). I’m sure I’ll have more comments as I get to grips with it more. Well done Brook and Team!